This trend is being talked among the chocolate community lately. The most recent to announce to join that trend is Paul a Young, which unfortunately I've been absent from his announcement of his bean to bar chocolate. My story takes me north to a town by the name of Cleethorpes. Visiting the chocolate festivals in London I met Duffy Sheardown and asked in the past as I was curious to see how you make the chocolate from the bean if I can visit. Finally a couple of weeks ago Duffy said I could come and see the magic. My first memory of a quality chocolate is Swiss chocolate in the Alps with snow peaks and water falls, but dream aside Duffy's workplace is industrial estate. In relatively small unit he manages to do everything. Duffy told me there isn't air condition so in the summer it can't get quite hot, but I assume solid chocolate in comparison to truffles aren't so sensitive to the British sun. Duffy explained us the process he follows to produce the chocolate. He receives bags of cocoa beans from Central America. The beans before packed and shipped are fermented. 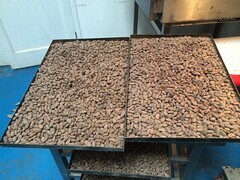 The beans when arrived are roasters first in the oven. Duffy experiments with different temperatures and time to obtain different flavours. The next stage the shell is being removed and disposed and what is inside the bean is transferred to the conching machine. 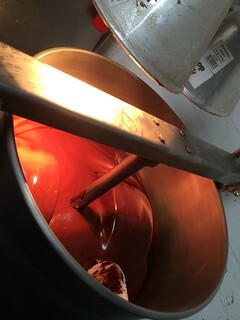 After so many hours the beans are transformed to a smooth paste, which is our chocolate. The next stage to increase the shelf life and to have the snappy sounds when breaking the bar. The chocolate is tempered. The tempering is a process of warming up the chocolate and then cooling it down (you can read more about tempering chocolate here). 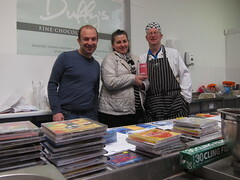 Duffy uses a tempering machine and after the chocolate is tempered it's transferred to a mould to cool down.